Foil bearings are self-generating, compliant hydrodynamics bearings. Their compliant foils conform to the size and shape of the mating rotating shaft. During operation, the rotating shaft of an oil-free high speed turbomachine is supported on a thin, self generated film of high pressure air or gas. 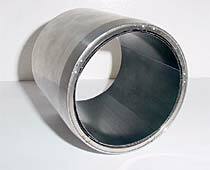 A pair of foil journal bearings provide radial support, and a pair of foil thrust bearings absorb axial load. Foil air/gas bearings have demonstrated high load carrying capacity, good stability characteristics, and extraordinary durability. A typical foil journal bearing includes one or more top foils, backed by corrugated foils that provide a small preload between the shaft and top foils. For low friction during lift-off and touch-down, the foils are coated with a solid film lubricant. During lift-off and operation, air/gas is drawn between the shaft and the bearing and locally compressed; hydrodynamic action causes the shaft to lift off and float on a cushion of air/gas. Foil thrust bearings work much the same way. Hydrodynamic action creates a high pressure air/gas film between a rotating thrust runner and coated top foil pads, backed by corrugated foil pads and arranged on a thin, circular plate. Thrust bearings absorb thrust load during startup and operation. The spring rate of the corrugated segments accommodates shaft expansion, shaft excursion and housing misalignment. The corrugated foils provide compliance and suppress whirl during operation, and they provide a flow path for a small amount of cooling air/gas. R&D Dynamics has developed foil journal bearings with diameters as small as 0.375 inches and as large as 6 inches, foil thrust bearings with diameters as small as 0.80 inches and as large as 9.00 inches.